In the wake of rain and storms earlier tonight, a radar phenomena known as "beam ducting" created anomalous propagation (AP, or in plain language, false weather returns). This is somewhat common in rain-cooled air that is found behind departing precipitation. One advantage of the brand-new dual polarization radar data is the ability to tell the difference between these false weather returns, or AP, and real precipitation. The correlation coefficient product returns certain values when the precipitation is real and other values when it is not. See the image below. On the left is base reflectivity, the product most people are familiar with seeing that shows location of precipitation. On the right, the corresponding correlation coefficient (CC) product. The area that is circled in green has a high CC value (reds are near the far right of the color scale on the right panel), indicating that the returns are likely precipitation. In the larger white circled area, what appears to be precipitation on the left has much lower CC values that are random and speckled. In this case, the radar returns are not actually precipitation, but AP. If you could see a loop of the precipitation product, you would see the real precipitation moving smoothly across the screen, whereas the AP jumps around irregularly - another clue that it is not rain. 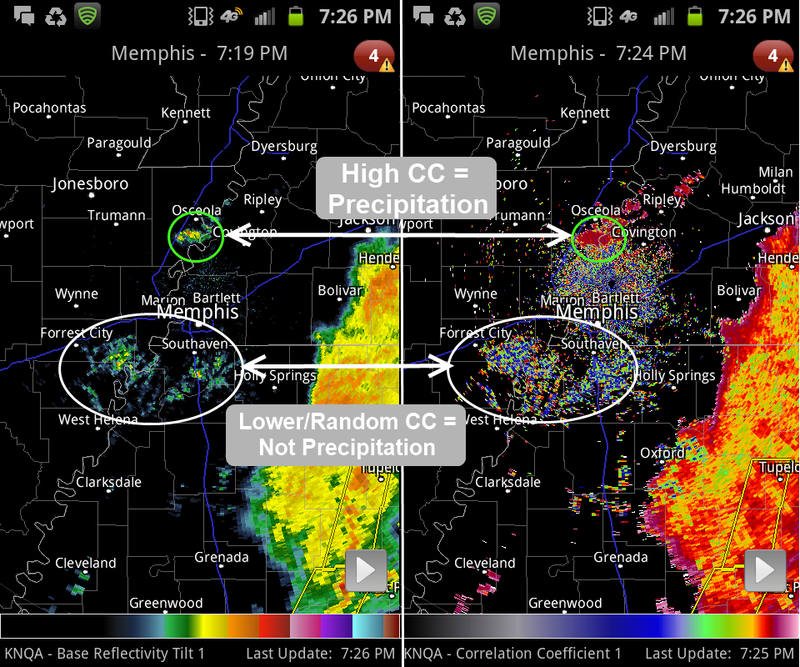 Hence, we have one benefit of the new correlation coefficient product from dual-polarization radar! For additional information on how radar beams behave in the atmosphere, visit this page from the NWS Jetstream program.